Canada was added to a priority watch list that includes China, India and Russia. U.S. Trade Representative Robert Lighthizer speaks during a meeting hosted by U.S. President Donald Trump with governors and members of Congress at the White House, April 12, 2018. In a news release, the office criticized Canada for "failing to make progress on overcoming important IP enforcement challenges" such as border enforcement, particularly when it comes to inspecting or detaining counterfeit or pirated goods shipped through Canada. The office's priority watch list includes countries that the U.S. deems to have failed to protect or enforce intellectual property rights or otherwise denied market access to American creators. The news release said the countries on the list would be the subject of what it called "intense bilateral engagement" during the coming year. 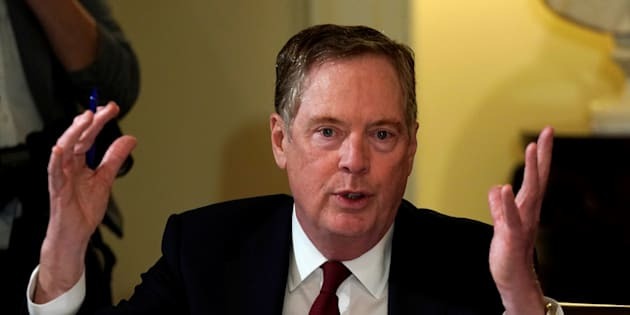 "This report sends a clear signal to our trading partners that the protection of Americans' intellectual property rights is a top priority of the Trump Administration," U.S. Trade Representative Robert Lighthizer said in a statement. Chrystia Freeland speaks with reporters after meeting with U.S. Trade Representative Robert Lighthizer to discuss NAFTA autos negotiations in Washington, D.C., April 25, 2018. Minister of Innovation Science and Economic Development Navdeep Bains introduces Blackberry CEO John Chen (not pictured) at the North American International Auto Show in Detroit, Jan. 15, 2018. The government's plan includes amending laws to eliminate barriers surrounding intellectual property, as well as better tools to expand its use. Ottawa also hopes to address what it calls "bad behaviour" in the country's existing IP regime with help from legislative amendments to curb intimidation and inappropriate "trolling" of some businesses by patent holders. Bains did not immediately respond to a request for comment on Canada's placement on the priority watch list.